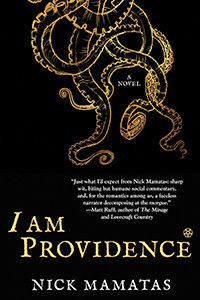 I Am Providence, Nick Mamatas (Night Shade 978-1597808354, $15.99, 256pp, tp) August 2016. In recent years Nick Mamatas has moved away from the horror, SF, and experimental fiction fields in order to write more crime fiction, including the 2013 novel Love Is the Law. I was afraid, if this trend continued, that I wouldn’t be able to justify reviewing his books for Locus anymore. That time may yet come, but fortunately, it hasn’t yet. His latest novel, I Am Providence, should be of particular interest to our readers for at least a couple of reasons. For one, it’s a murder mystery set at a genre convention: the Summer Tentacular, devoted to H.P, Lovecraft and his Mythos, held appropriately enough in Lovecraft’s hometown of Providence RI. (The book’s title is taken from Lovecraft’s famous epitaph.) Given how prevalent discussions of Lovecraft’s influence and his problematic qualities have been in our field lately, it’s an astonishingly timely book. If the convention angle doesn’t make it SFnal enough for you, there’s a bona fide speculative element: half the novel is narrated in first person by the murder victim as he lies cooling on a morgue slab. It’s practically a stage of human psychological development: hit middle age and write a mystery novel about one’s workplace in which the most loathsome employee has been brutally murdered, and all one’s co-workers are suspects…. Novelists work alone, but fandom is pretty much a workplace for pros in the field of fantasy and horror. The victim (and intermittent narrator) is Panos Panossian, Internet gadfly and author of The Catcher in R’lyeh, a mash-up of Lovecraft and J.D. Salinger that brings to mind Mamatas’s own debut Move Under Ground, which combined Lovecraft and Kerouac. (Panos isn’t as successful personally or professionally as Mamatas, and is Armenian-American rather than Greek-American, among other differences, but the inspiration is clear.) Panossian came to the Summer Tentacular intending to sell his copy of a mysterious book called Arkham, author unknown, that’s bound in human skin. Instead, someone kills Panossian, cuts his face off, and (presumably) steals the book. 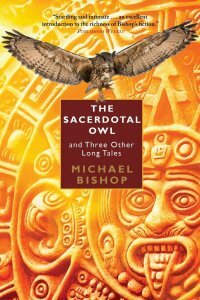 Panossian tells us about the murder himself, though his memory is addled, possibly because he’s dead and his brain is decaying, a situation he finds just as unexpected and dismaying as any of us would. As the novel goes on, he fills us in on his life and career, and provides details about some of the most likely suspects at the convention. Colleen – a green-haired, vegan, outspoken feminist Mythos writer – is an engaging protagonist, and makes a compelling amateur sleuth. She has all the right qualities for the job, including ingenuity, doggedness, and a willingness to take part in ugly confrontations. She’s also fairly plausible as far as amateur detectives go, in that she isn’t some sort of hyperintelligent savant who keeps tripping over dead bodies every weekend, but just someone who happened to be in the wrong place at the wrong time, and becomes determined to needle and blunder her way to the truth. In the course of her investigation-slash-meddling, Colleen questions members of the convention, annoys the police, and stumbles into jeopardy both legal and physical. Along the way she tangles with various figures of fandom: emotionally unstable fans, obsessive small press collectors, a self-styled Cthulhu cultist, a self-important Lovecraft scholar, a bloviating man who hijacks a panel (how prescient! ), and assorted weirdos, racists, and malcontents. There are a few more sympathetic characters, too, most prominently one of the only other women at the con, writer and editor R.G. The characters are recognizable types, and sometimes not just types, but specifics; those familiar with the intimacies and intricacies of small press horror will recognize characters at least partly inspired by individuals in the field. There are some great set pieces, notably a ritual to bring Cthulhu to life (spoiler: it fails) and an expedition by members of the convention to try to dig up Lovecraft’s dead cat – you know, the one with a name I’ll decline to print here. Mamatas plays fair with the mystery elements, offering up reasonable red herrings and a few easy-to-overlook clues about who the real perpetrator or perpetrators are. 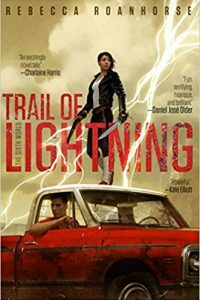 The stakes keep rising, too, with further crimes committed, and pressure mounting on Colleen (from both her fellow convention-goers and the cops) to drop her investigation, and it all builds toward a satisfying conclusion. Mythos fans, mystery fans, and convention-goers (some of us are all three!) will all find plenty to like here. Mamatas may be more of a crime writer than a horror or SF writer these days, but he’s still hanging out in the same bars and parties with us.